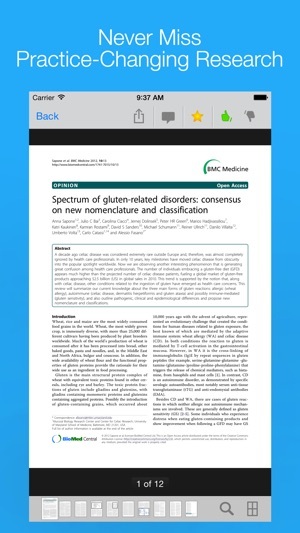 'Read by QxMD' provides a single place to keep up with new medical & scientific research, read outstanding topic reviews and search PubMed. 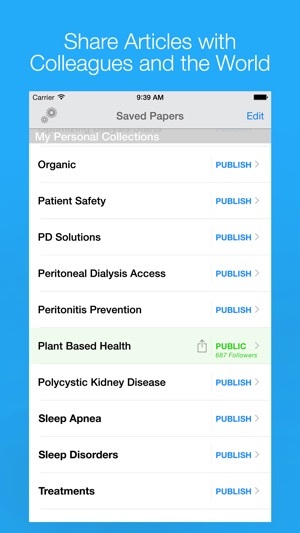 This iPhone & iPad app provides a simple interface that drives discovery and seamless access to the medical literature by reformatting it into a personalized digital journal. 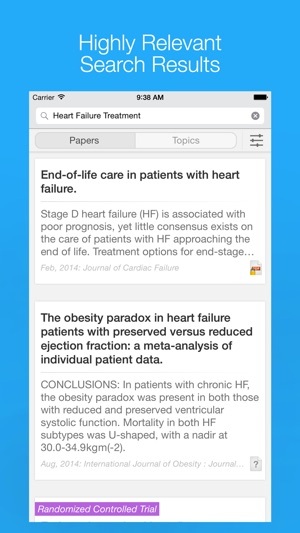 4¾ stars: "The Flipboard for medical journals has arrived" and among "...the most innovative medical apps"
On Apple's 'What's Hot' list in >60 countries, as well as Medical Essentials & Apps for Healthcare Professionals. 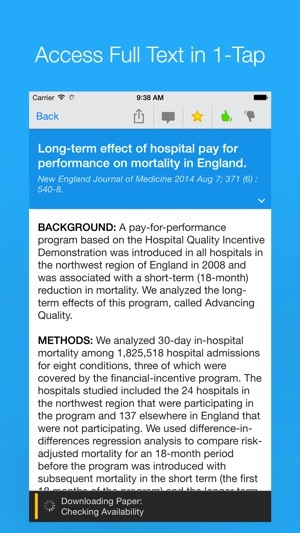 Featured in Apple iBook: "iOS in Healthcare: Revolutionizing Healthcare Productivity"
- Read your favorite journals or browse article collections. Why did we build 'Read by QxMD'? Health care professionals need to stay up to date on the latest medical research and topic reviews to provide optimal care. Unfortunately, the process of content discovery is broken with research artificially compartmentalized by publishers and hidden behind countless institutional pay walls. At QxMD, we believe that knowledge translation– the process by which new knowledge is incorporated into clinical practice – is an important and unsolved challenge for our health care system. We hope that ‘Read by QxMD’ will be a part of the solution. Seamless 1-tap access available at thousands of institutions. Title and MeSH Headings from MEDLINE®/PubMed®, a database of the U.S. National Library of Medicine. Founded by medical professionals, QxMD is dedicated to creating high quality point-of-care tools for practicing health care professionals. I’ve used Read for about 5 or 6 years and continue to be impressed. Once linked with library holdings there is no easier way to get and organize scientific literature in full text pdf form. On top of everything it’s still free. The only thing missing is a polished non-mobile platform (ie for my laptop). It’s there but there is definitely a stylistic and functional gap btw that and the iOS version. Still 5 star and highly recommended. Source: CT Anesthesiology Fellow at large academic institution/hospital setting. Feature request for a five star app! I like the new layout, faster pdf link detection compared to the previous versions, however I miss a key feature, the ability to swipe between abstracts. 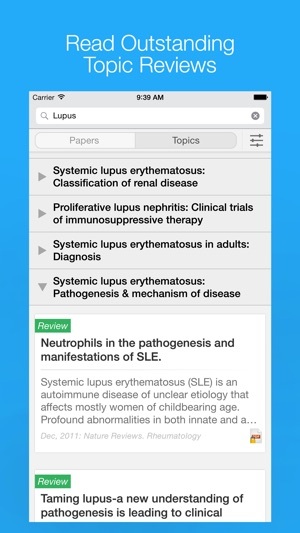 I have to close an abstract to be able to read the next one, it would be nice to be able navigate by swiping between them. Also would be nice to have the collage view in the My journal. While I read abstracts from one journal, I do not want to see the list of journals, it is distracting, and uses valuable screen space. Thank you however for the great app. Great app! Great support for the higher resolution XS and pro devices. We did notice an recurring issue with newer arcticles, likely those published ahead of print. The issue results in a PDF of an unrelated article in a different language being downloaded. This does not correct a month later if it already downloaded the incorrect article. We love the app. Can you fix this bug though? Glad you love Read - we hope you’ve noticed full support for iPhone X and iPad high resolution. We've just released an update (Version 7.3.2), which should resolve the issue with the incorrect article downloading. Please keep in mind that if you are trying to access an article that you have previously downloaded with the incorrect PDF, you will see the same random article. To fix this, please go to Settings --> App Settings --> Manually Delete PDFs --> Delete the PDFs that you would like to try to access again. © 2019 QxMD Software Inc.